Shanghai thought it could keep me there, but it could not. And after some rushing I made it home, ducking in between thunderstorms like an un-laden swallow. I passed out in my hotel room, since it was too late for anyone to come and pick me up. I had a waffle for breakfast – it was magic. Later that day, my little nephew is the first to see me, and he sprints down the hotel hallway like it’s a movie set. His reward for pageantry is a giant bear hug. My first impression on the way home is the way nature seems much brighter in Indiana. Perhaps it’s the clean air after the thunderstorms, but the sky is so incredibly blue, and the sun is so bright. I am willing to admit that this also might have been fatigue, that I might have been a little overwhelmed. But it was a good overwhelmed – I was overwhelmed by beauty and fresh air and hugs, and a child’s voice rambling on about Minecraft. The next day I drove to the middle of Illinois and spent an evening playing board games with friends at Eureka College. This is the first year in four that I’ve missed the Central Illinois Stage Combat Workshop. This is the third time in four workshops that I’ve arrived at Eureka from a foreign country… I’m gonna bask in how cool that sounds for a moment…aaaaand done. Anyway, there is really nothing like reunions with friends and swords. A friend says, “Hi! Do you want to play?” And then there’s a rapier in my hand and all is suddenly right in the world. The trees grow a bit greener, the birdsong is a bit more melodic. That giant cinnamon roll I ate for dinner is going to push me through my inevitable jet lag slump. And the night grows late playing board games. I am high off the nerdy infusion. The next morning is more travel. 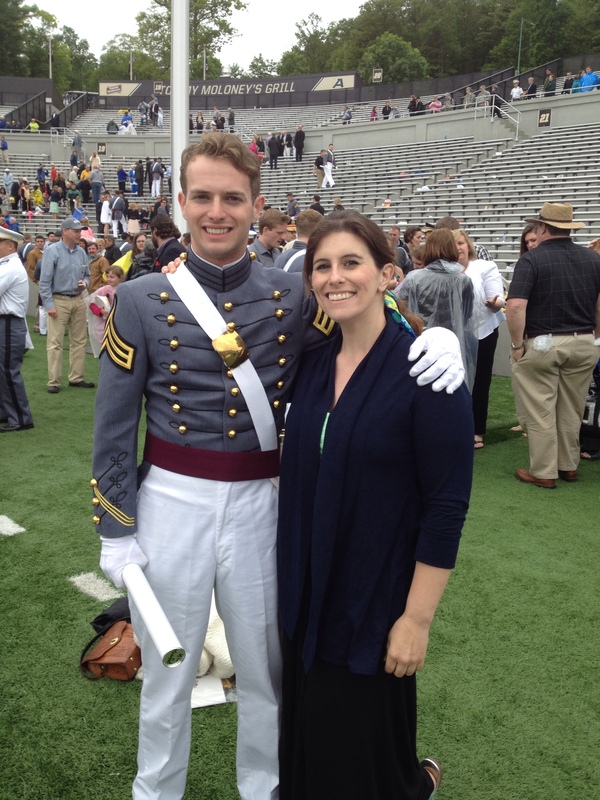 My reason for coming home in the first place – to watch my brother graduate West Point and become an officer in the US Army. It’s also turning out to be a mini family reunion, with almost everyone from my mother’s side of the family arriving to celebrate. It’s like my homeland is rolling out the fair weather carpet for me. 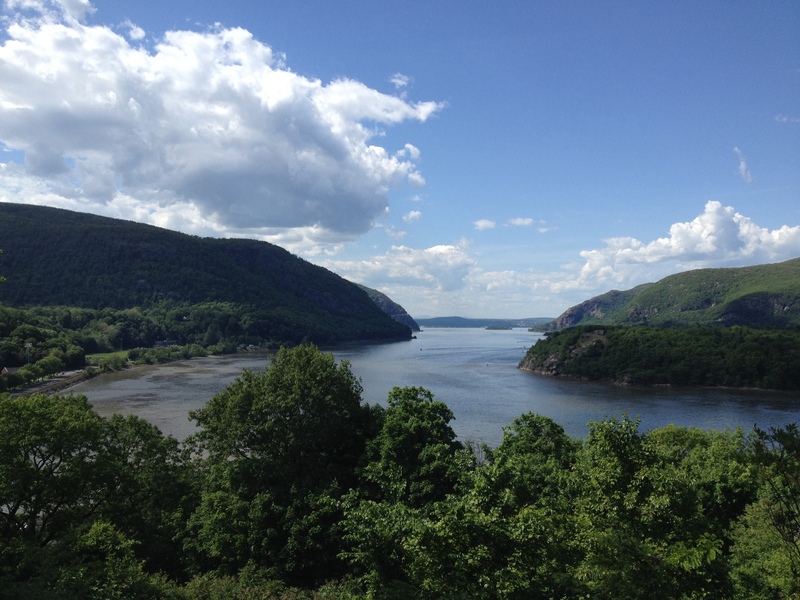 Going to the Superintendent’s Reception, I stand on Trophy Point and bask in the Hudson River. 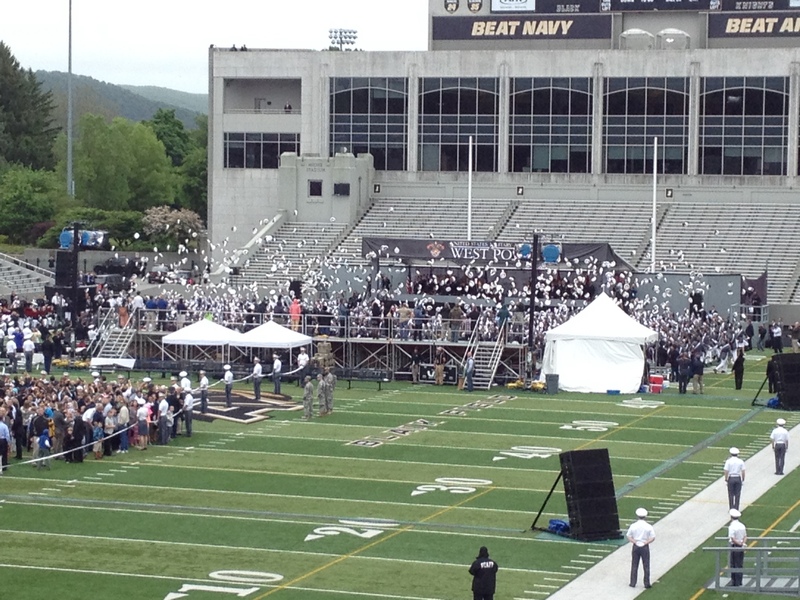 I am a sucker for pomp and circumstance, and West Point lacks for neither. The cadets march out on to the Plain, looking all smart and shiny in their grey over whites. The Firsties have their tall plumage hats, and march with the precision of four years of practice. The band plays Souza and everyone seems to want to beat the Navy (Army hasn’t been Navy in a decade at least – not in Football, anyway). There’s a dinner, where we perform many toasts and everyone is dressed in their finest. During Graduation, President Obama delivers a policy address which really doesn’t do or say much that’s uplifting. He does pardon all the minor offences of the underclassmen, which brought much rejoicing from the cadets. But I found myself a little unimpressed by his words – it was perfunctory and joyless. I didn’t like how people did not rise when Obama entered. You may not like the man, but you respect the office of the leader of our country, and rise as is custom. Even some of the cadets looked like they did not stand. I do not approve. Has our petty politicking got to the point where we have forgotten the basic terms of etiquette? They all look so young. I am not old yet, but they look so young to be leading men to fight. They look so young to die – a sudden, morbid thought. I can’t wrap my head around it, even now, typing it. It doesn’t seem a tangible thing, a real possibility. 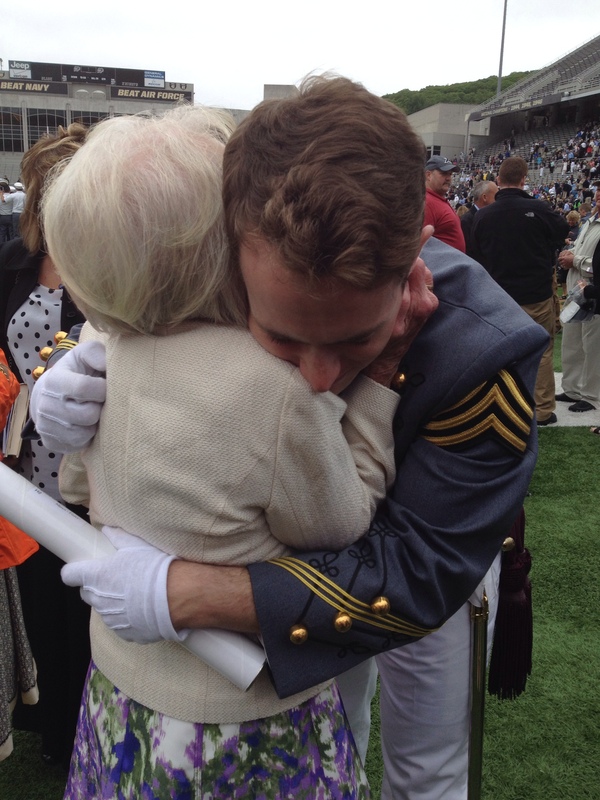 I look at the sea of smartly dressed cadets, of precision and pride, and I wonder about the future. I studied warfare for all of my college and graduate school years. I know what is coming, in a way. I am at once proud and a little terrified that my little brother is a part of it all. Grandma Jean looks like her face is going to burst from the smile she’s giving. Ninety years old, an Army nurse herself, and she looks like she’s going to simply float away on her joy. My little nephew is crying – he did not get a hat. There is the custom of all the graduates throwing their hats into the air. The children get to go and collect them like Easter eggs. The cadets leave notes and usually some money in each hat. My nephew knew all this, because it had been built up for him. He’s crying to my brother – someone took his hat. He got shoved, and someone took his hat and now he doesn’t have one and everyone else has one…the poor kid can’t control his sadness as he looks at children carrying more than one hat with them. I feel a surge of protective aunt-edness – who dares take my nephew’s hat?! My sister calmly reminds him that a child saw how sad he was, and gave him a twenty dollar bill that was in one of the hats he carried. So my nephew has the reward, but not the required item. He claims he’ll use the money to buy a hat. I remind him that he’s the only kid with a pair of jump wings pinned to his sweater (a gift from his para-trooping Uncle). After all that talk of duty, responsibility, honor, family, and a code of virtue, it’s still just a mad grab and selfish hands at the end. I’m saddened by this. I wanted everyone to be stirred by the words, by the pomp and circumstance. I’m saddened that the hat finding ceremony devolved into a Black Friday / Easter egg hunt, complete with shoving and poor sportsmanship. And it’s the responsibility of adults to help children see this, because children have a difficult time understanding rhetoric. We’re surrounded by reminders of sacrifice and nobility, and yet it’s like we can’t see past the “MINE!” of immediate gain. In support, in service, and for family. There’s something which resonates with me around the idea of service. The idea of giving of yourself to preserve an ideal – it’s something I want to do. If only the government would agree that I could be a useful tool. I may not be cut out for the military, but there are other ways to be helpful. That, however, is not the point of this post. I would not say this was a vacation. Every day started earlier, every day I got a little less sleep. In the span of a few days I swirled together time with relatives and friends and family, and I tried to make sure everyone was happy. I didn’t succeed – I didn’t have enough time to spend everywhere I was needed, and I disappointed people. 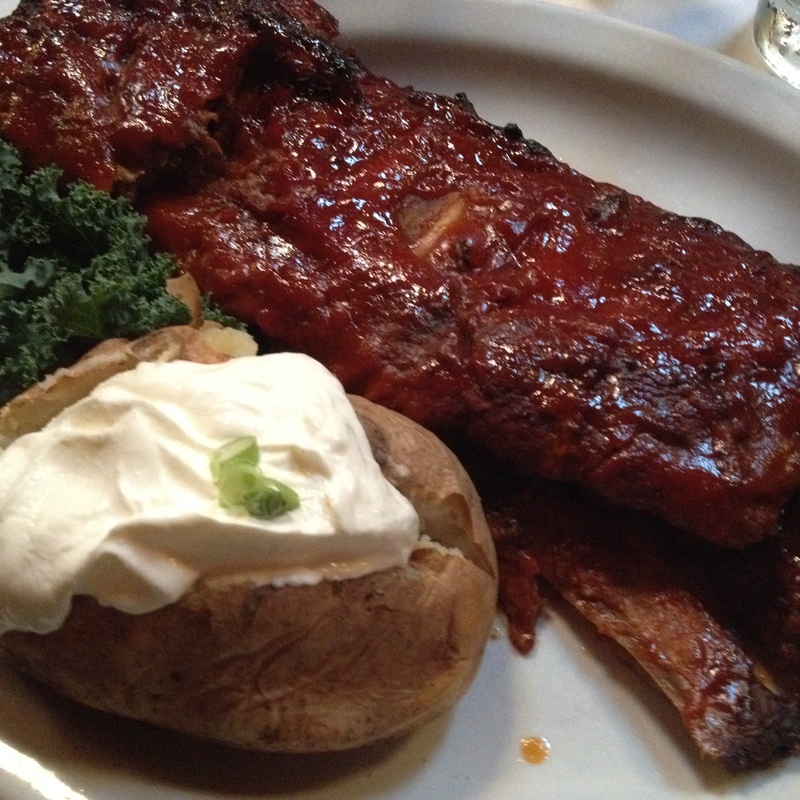 I got to eat barbeque, and cheese, and drink tap water. Glorious tap water with ice cubes in it – ICE CUBES! All my little fruit trees survived the polar vortex, the wisteria I planted is finally going to bloom, and my three remaining barn cats were not feline in their joy of seeing me. 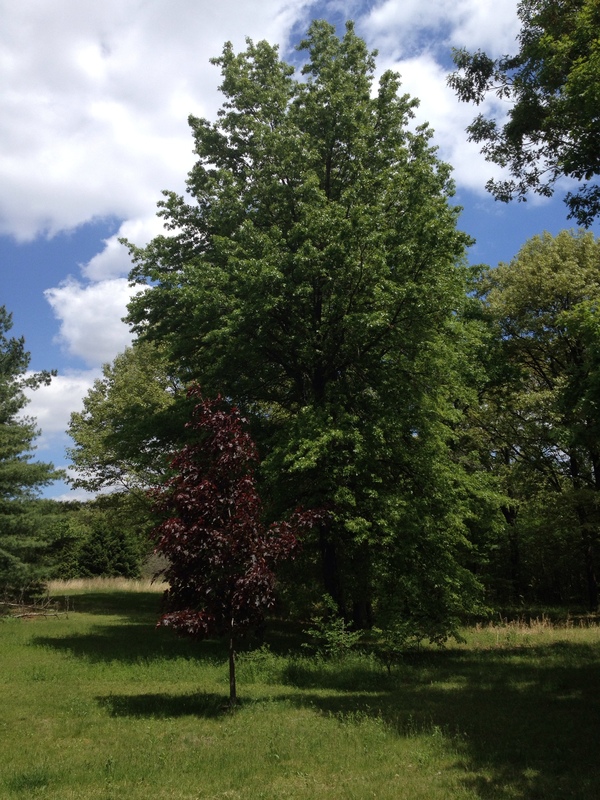 I got to see the verdant green of my back yard in spring. I visited the New York Natural History Museum and saw an exhibit on poisons (random, but family generated). And I got to watch my brother try and eclipse me. A valiant effort, little brother. I might concede that you did well, and that I am proud of you. That you’ve done something amazing and that you’ve done a good job at taking the family name to new heights. As your elder sister, however, it is my duty to tell you that you’re not done yet. I’m not done making you earn your stripes, such as they are. This is just the prelude. Now the real show begins. En garde! 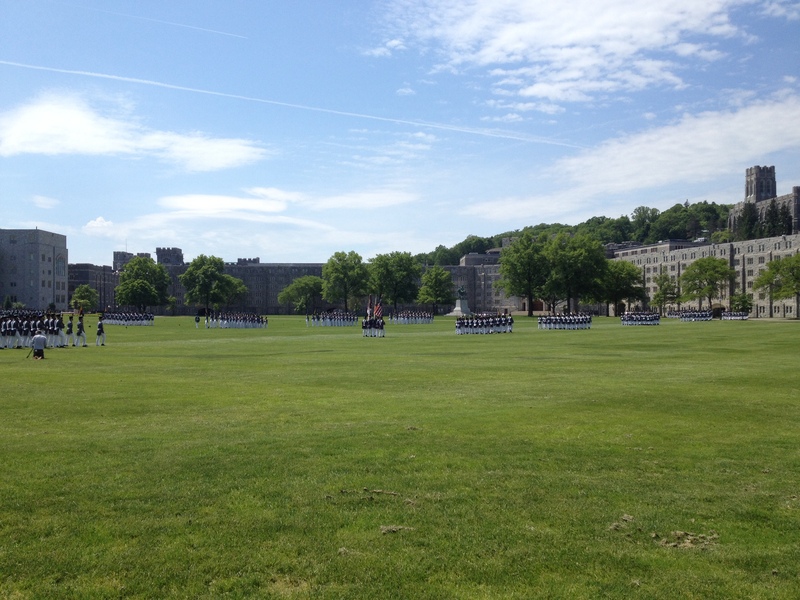 This Post was posted in Observations, Places, Reflections, Travel and tagged Circumstance, Family, Going home, Graduation, Home, Military, New York, Obama, Pomp, Returning Home, Toasts, Travel, USMA, USMA class of 2014, Vacation, Veterans, Warfare, West Point. Bookmark the permalink.